With thousands of tweaks available over at the Cydia Store, it can be an often trying effort to locate the best and most useful to grace your iPhone, iPad or iPod touch. Here at Redmond Pie, we try our best to thrust some of the most productive, innovative and well put together jailbreak hacks into the spotlight – separating them from the scores of time and money-wasters. Apple has placed a lot of emphasis on improving the various niggling users issues in its mobile operating system with iOS 5 – with Notification Center being one of the most obvious. Despite the flurry of changes, (allegedly 200+), there still is, and always will be, room for improvement. SMS is arguably the most important feature of any smartphone – alongside, of course, the actual phone feature. Siri’s great and all, and so are the many other capabilities on smartphones which we could have only dreamed of 5 or so years ago; but the call and text functionality make up the fundamental part of any handheld calling device. The SMS app has been greatly improved, with iMessage allowing any iDevice user running iOS 5 to send free messages to each other – similarly to what BlackBerry devices have been doing for years with BlackBerry Messenger, or BBM. Unfortunately, the SMS.app is still far from the complete package, and if I were to ask you which features are still lacking, I reckon we could compile a pretty extensive list. One feature, which has been offered by phones dating back to the monochrome Nokias, is some form of delivery receipt. 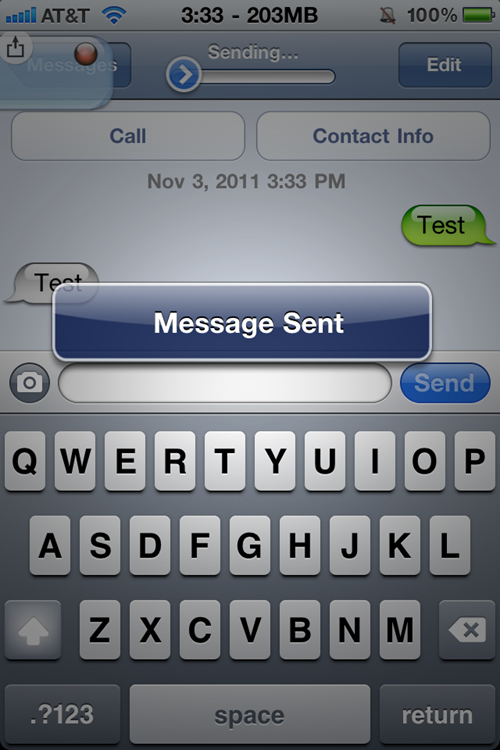 SMSConfirmation, a jailbreak tweak developed by william_vab, presents you with a useful info bubble confirming whether a message has been sent or has indeed failed. It works great on iOS 4 and iOS 5, and has just been updated to version 2.0, having only been released into the wild some two weeks ago. It’s free, and available over at the ModMyi repository – one of the defaults on your source list. We think there is huge potential for this tweak to be taken to the next level, with possible detailed reports, and even a separate section within the SMS.app detailing specific times of receipt. After all, it’s good to keep track of everything! You will need to be on a jailbroken iOS device if you wish to install it. You can follow our step by step guide posted here to jailbreak your iPhone, iPad or iPod touch on iOS 4.3.5 using Redsn0w (or PwnageTool), or on iOS 4.3.3 using Redsn0w, PwnageTool, Sn0wbreeze & JailbreakMe (that last one being the easiest). For jailbreaking iOS 5 tethered using Redsn0w, you can follow our complete step by step guide posted here, or here if you want to use Sn0wbreeze on Windows. Since jailbreak on iOS 5 is currently limited to tethered boot only, you can install ‘SemiTether’ patch (instructions here) from Cydia to make your jailbreak semi-tethered on iOS 5. For those of you on iOS 5.0.1 can follow our instructions posted here on how to jailbreak using Redsn0w or here using Sn0wbreeze.